Unilever is a British-Dutch transnational goods company co-headquarters in the United Kingdom and the Netherlands. Unilever is one of the biggest multinational companies in the world, with its products being available in more than 190 countries. Unilever engaged Gametize in 2015 to build a simple and scalable personality quiz. A key feature of Unilever’s decision to engage Gametize was the sustainability of the platform – while other similar providers also offered engagement solutions, Gametize’s Administrator Dashboard allowed Unilever’s content creators the freedom to create and edit content easily and quickly. 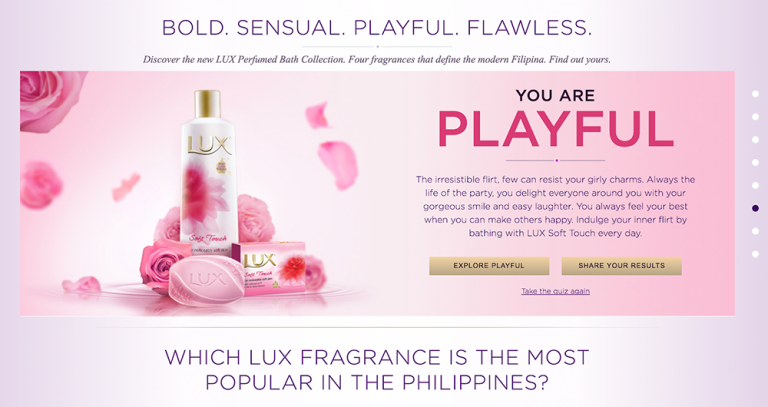 Unilever devised 7 questions to form the “Which Lux fragrance is for you?” personality quiz. This was rolled out in October 2015 as part of the first phase of the campaign, which included a full media launch using TV, radio ads, social media, and influencers. Players could choose from 4 options for each question, and would then receive a “personality type”, along with a recommended scent. From there, Players could explore the scent in more detail as well as share their results on social media. Gametize’s content management system was accommodating to content – for both the questions and feedback options – allowing for flexibility to easily and quickly make content changes and updates. This also simplified the process of localizing content to suit different markets and regions. Through Gametize, Unilever implemented a sustainable personality quiz that they could utilize create an “always-on” content. The House of Lux “Which Lux fragrance is for you?” quiz produced highly engaging results – with over a 90% completion rate spanning over 12,500 submissions. This highly engaging personality quiz that allowed users to generate shareable and personalized results.